Gone is the Whitney Hotel, the Shandon icon that was home away from home to legislators and that was touched by a University of South Carolina athletics scandal. Now converted to the 700 Woodrow apartments, its rehabilitation reflects a larger transformation of the Devine Street commercial district. 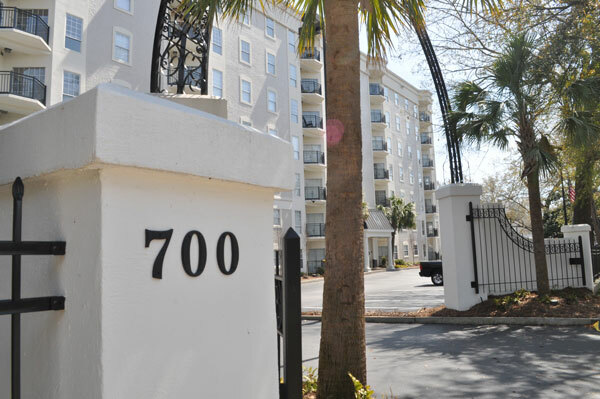 The former Whitney Hotel is now the 700 Woodrow apartment building, and the owners and workers at nearby businesses say it has improved Devine Street’s commercial district. The conversion, which began in July 2013, was completed in August, and 700 Woodrow already has sold out most of its 75 one- and two-bedroom units, said 700 Woodrow marketing manager Grace Salter. “We are bringing fresh new faces to Shandon,” Salter said. One-bedroom units, at 665 square feet, rent for $975 a month. The 1,050‑square-foot two-bedroom units rent for $1,195. In a conversion like 700 Woodrow, “everybody wins,” said Scott Smith, an assistant professor in the hotel, restaurant and tourism management school at the University of South Carolina. “A new apartment building helps local businesses and compresses what is available downtown,” Smith said. AnnaBelle LaRoque owner of the LaRoque clothing store next to Devine Foods, moved into a two-bedroom unit at 700 Woodrow while her house is under renovation. LaRoque she said enjoys living so close to work. “The convenience was a huge factor,” she said. Grace Salter, 700 Woodrow’s marketing manager, says she feels strongly about creating sense of community. The Whitney was built in the early 1980s as a condominium but was quickly converted to a hotel as the housing market crashed when interest rates climbed near 20 percent. Over the years, it became a regular residence for some out-of-town lawmakers during the legislative session, and in 2011 it became caught up in a USC athletics scandal with the discovery that some athletes were getting discounted rooms. The Devine Street business district also has had to reinvent itself after a downturn that began in the mid-1990s. In the past few years, new businesses have moved in, and the area “seems to be experiencing a nice revival right now,” said George Kessler, owner of the Il Giorgione restaurant, which opened in late 2012. Kessler thinks that through all the changes, the backbone of Devine Street is the rapport the businesses owners have with surrounding residents. Hear Il Giorgione restaurant owner George Kessler talk about what he thinks is best about Devine Street.